Three black triangular boxes each with three chambers for nine swift pairs. We left London on the 8 o'clock train to Wales and voyaged on the 12 o'clock boat over the Irish sea at the start of our search for Laputa, Jonathan Swift’s legendary city, that hovers on a magnetic field high above the ground, where super intelligent inhabitants are busy all day long thinking only about art and science. We were sure that if we visited them they would probably enlighten us about the nature of what we do. This made no sense to us at the time but opened up a pathway of enquiry for our upcoming journey to Ireland. After several expeditions, adventures, wonderful encounters with new people, endless discussions and intense afternoon naps in lavender fields we finally realised the truth at the core of our investigations. One silent evening, sitting on a balcony overlooking the old Dublin neighbourhood of Monto, the scream of a single Common Swift flapped us back to consciousness again. We, the artistic researchers are the Laputians! We actually have no idea how to usefully deploy our knowledge anymore – trapped in the internalised belief system of contemporary art and the death spiral of reference. It is the swifts of today that are missing from the picture. miles from their winter quarters to spend the summer with us before returning south at the break of autumn. They live on the wing, eat, drink and sleep in the air for years, and hardly touch ground except to shelter from storms and nest their next generation. Through the slow construction of cities in the last centuries they dained to cohabit with us but due to current patterns of urban development they are now rapidly disappearing. 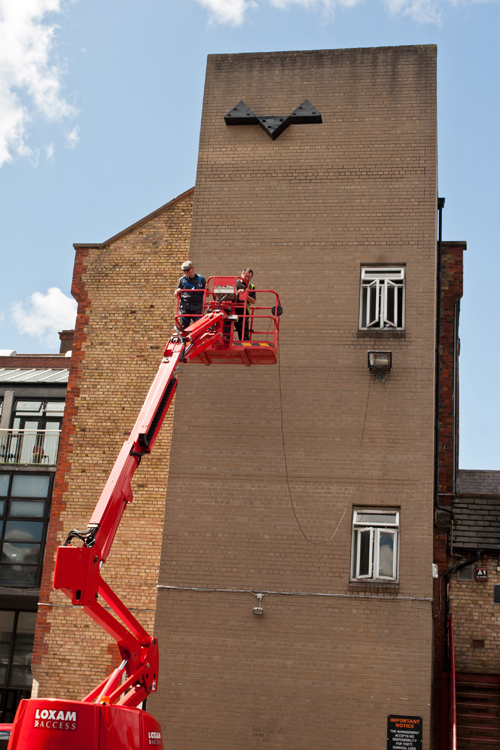 We used the given time and resources to build a new fortress for these entities, high up in the air, 16 metres above the ground, on the north face of the Firestation Artist’s Studios – an invitation into the future to return again and again and again. If the seasons have an ambassador, it is the swifts. Produced at Black Church Print Studio, Dublin and editioned in London. 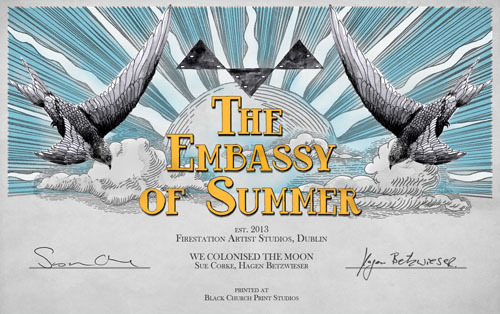 Hand coloured etchings are available from Firestation Artist Studios Dublin for less than the weight of a swift in €. All proceeds to contribute towards the cost of producing and maintaining the Embassy. who initiated this pilot residential exchange between emerging Irish and British artists.